An anonymous tipster e-mailed us the first-ever official photos of the MINI R60 crossover, also known as the Countryman and the Crossman. Full details, and the pics, inside. An anonymous source has leaked three official photos of the MINI R60, also known as both the Countryman and the Crossman. The photo leak comes just a day after the manufacturer officially released a teaser video of the crossover. 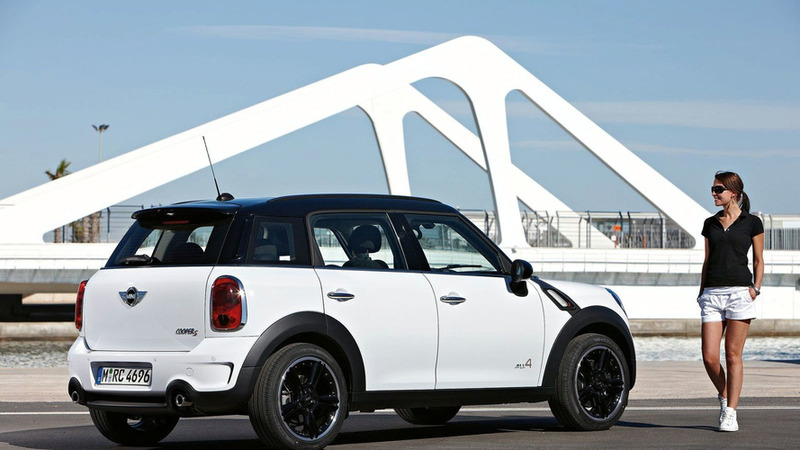 Seen in the photos is the Cooper S version of the Countryman. Emblazoned with the "All4" all-wheel-drive badge, the car does not appear to be as tall as the MINI Beachcomber concept shown in Detroit. As expected, it does have the same headlights, with foglamps in a similar position. The Pepper White vehicle with a black roof shows off an all-new grille and front bumper, as well as previously-unseen blacked-out wheels. The car maintains three windows on each side of the vehicle, like the Crossover concept. However, the taillamps and hatchback shape are more akin to the Cooper. Dual exhaust pipes are still on either side of the vehicle, but are no longer completely surrounded by the bumper. Inside, the car has a very similar design to the rest of the MINI lineup. The oversized speedo is mounted flush in the middle of the dash. A panel of six toggle switches is a bit below that, with another row of switches mounted at the rear mirror. The car's white headliner contrasts against the black seats nicely, but we could have done without the teal door inserts. The MINI R60 will hit the market by the end of the year at €25,000, adding roughly €4,000 for the Cooper S version of the unit. Despite the official reveal taking place in Geneva at March, we expect more information to come out now that official photos have been leaked.